In the wake of the 2017 Rohingya crisis and ongoing fighting between the military and Arakan Army, the Myanmar government is desperate to attract investors to Rakhine State in hopes that they will help reverse the fortunes of one of the country’s poorest regions. To that end, it invited more than 600 of them to the beach resort town of Ngapali on Thursday, Friday and Saturday for the first ever Rakhine State Investment Fair, which was opened by State Counselor Daw Aung San Suu Kyi herself. Foreign and domestic companies signed 28 expressions of interest for projects worth a potential $4.9 billion. Businessman U Htun Htun Naing has been playing a key role in helping the state government bring investors to Rakhine. He is also chairman and group CEO of Blue Ocean Investments and of Blue Ocean Operating Management Co. Ltd, based in Yangon. The Irrawaddy’s Nan Lwin spoke with him about the current investment climate, China, Japanese and Indian interest in Rakhine, and what government technocrats are doing to try to revive Rakhine’s image abroad. What sectors in Rakhine have the most potential for investment? Rakhine State has abundant opportunities for investment. The Rakhine Investment Fair wants to attract both foreign and local investment, particularly for infrastructure projects such as building and upgrading roads, bridges and ports. Once we receive investment for infrastructure, we can move on to production-based industry, the fisheries sector, and service-based and value-added industry. What are the priority foreign investment projects for Rakhine State? Speaking of infrastructure projects, we now have investors for the Kyaukphyu Special Economic Zone in Kyaukphyu, and also for the Kaladan Multi-Modal Transit Transport Project in Sittway. However, we need to upgrade road access to other parts of the country. We have improved access to electricity for the public, but we still need more for industrial use. The government is currently implementing a 30 MW power plant project in Kyaukphyu. We need airports. For example, we need to upgrade the Thandwe and Mrauk-U airports. After all those projects are completed, conditions will be better for additional investment here. 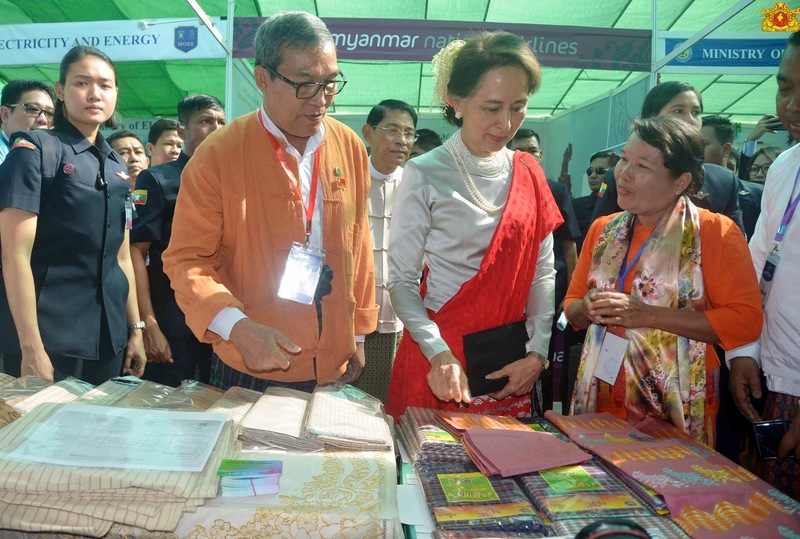 State Counselor Daw Aung San Suu Kyi visits a fabric stall at the Rakhine State Investment Fair in Ngapali, Rakhine State, on Friday. As far as we know, the Rakhine State government has invited investors to invest in six major projects. Are the investors interested in investing in those projects? Yes. We have showcased six major projects from the project bank that was introduced by the Union government at the Invest Myanmar Summit in Naypyitaw. Actually, Rakhine has more than that. That’s why we are having a separate investment fair. In terms of the countries interested in investing in Rakhine, China is the top country, Japan is second and [South] Korea is third. Furthermore, among neighboring countries, India and Thailand are also interested in investing in Rakhine. Which projects do they want to invest in and why? There is a power play among the countries. After China and Myanmar agreed to implement the Kyaukphyu Special Economic Zone, Japan and Korea also became interested in initiating mega-projects in Rakhine State. Rakhine occupies a unique geographic position next the India. We have the greatest sea access and own the longest coastline in Myanmar. So investors really love to invest in Rakhine. However, it would be better if we had more investment, particularly from Korea, Thailand and India rather than China. Because, as we have said, we would like to invite responsible and sustainable investment from foreign investors. You mentioned that Japan and Korea are interested in mega-infrastructure projects. Can you provide more details about these projects? Korean investors are eyeing the construction of a new city that they have submitted a proposal for. Moreover, Japan has proposed building both mega and small industrials parks in Rakhine. Thai investors are interested in investing in the tourism sector, especially in Ngapali and Mrauk-U. If we can upgrade and build airports in Mrauk-U and Ngapali, that would help boost the tourism sector in Rakhine. India is also interested to operate ports. Although India and Myanmar have been working on the Kaladan Multi-Modal Transit Transport Project, the Rakhine government just received new proposals from Indian and local investors to build ports in other part of Rakhine. When we talk about foreign investment in Rakhine State, the investors mostly point out infrastructure problems, electricity and roads in particular. How are you dealing with the infrastructure problems? When it comes to attracting foreign investment, electricity and roads are crucial for Rakhine State. We will start a mega-electricity project in Kyaukphyu. Moreover, the government has plans for electric power projects in Sittway and Ponnagyun. The government also received proposals for a mini-grid to provide electricity to villages. Furthermore, we only have access to the sea. We also need better access to the interior. We will need upgraded roads to reach China if we are to implement the One Belt One Road Initiative projects. If we have better road access, we can be the major hub for transporting goods from upper Myanmar to India. So we need to upgrade road access. The government is also inviting BOT [build, operate, transfer] for the road construction projects. We all know Rakhine has problems securing investment because of the Rohingya crisis and the armed conflict. What is your opinion on that? Rakhine is a big state that stretches from south to north. The crisis happened in the northern part of the state — Buthidaung and Maungdaw — which borders Bangladesh. Except for Buthidaung and Maungdaw, the rest of the cities — Sittwe, Mrauk-U and Kyauktaw — are peaceful. Kyaukphyu, Thandwe, Gwa, Manaung and Ngapali in particular are the most pleasant places in southern Rakhine. When we look at the map, the crisis happened in a small part that is less than 10 percent of Rakhine State. However, Rakhine’s image has been tarnished because of the international media’s portrayal. Now we are conducting a “Beautiful Rakhine” campaign to revive our image. As you see today, 65 percent of the attendees at the fair are foreign investors and only 35 percent are local investors. We have problems, but we can solve them. Investment should aim for long-term benefits. I hope investors can invest more for the long-term benefit of the state. We also found out that the root causes of Rakhine’s problems are education and the economy. If we have improvements in education and the economy, we will have less crisis. This was also mentioned in a report by late U.N. Secretary-General Kofi Annan. What are the government and your team doing to revive Rakhine’s image? As a first step, we are working on the” Beautiful Rakhine” campaign together with the Rakhine government. We uploaded a lot of photos that show the beauty of Rakhine. We currently reach 7 million people on Facebook. As a second step, we participated in the Invest Myanmar Summit in Naypyitaw. As a third step, we will publish a report about the results of this fair including short- and long-term plans for implementing the investment agreements. We have also traveled abroad to China, India and elsewhere to attract investment and to explain Rakhine’s situation.